Always sounds like you guys are saying my name at the end of the show! And I helped! I will try to steal some batteries out of my remote control so that I can photograph my 4 handgunners tonight. They are coming along nicely. So, you managed to finish this mount in what? Fourteen hours? It looks really good. Also, I am impressed that you were able to add so many tufffffffffttttttssssss. PS: I would hit the snakebite leather with one more line highlight. Maybe 3 parts leather, one part bleached bone? Just at the crest of the saddle. Peyton that looks really good i especially like the skin how long did it take? are the tufts from silflor? Holy cow - that model is fantastic! I love how you picked out all of the details on the armour. Also, the skin looks excellent! Did you use any of the new paints? Love it! Especially the mane! Jeff: Yeah, round about 15 hours, and all the armour on the knight! I needed those tufts! That base is so huge I needed to find some filler yo! The bases covered in archers will probably have fewer tufts on them ;) Also agree on the saddle, it looked good after 10 straight hours painting, when I could no longer construct sentences or figure out where I was. Martin: I didn't time the skin, but it took ballpark 2 hours? Ill find out when I paint the next one. 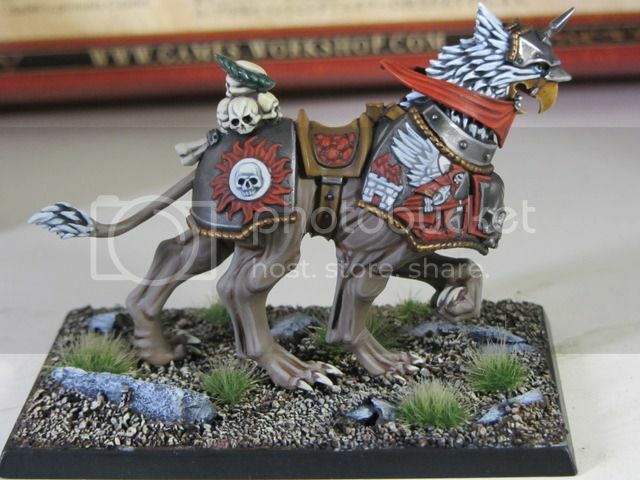 The tufts are army painter, they're pretty nice! 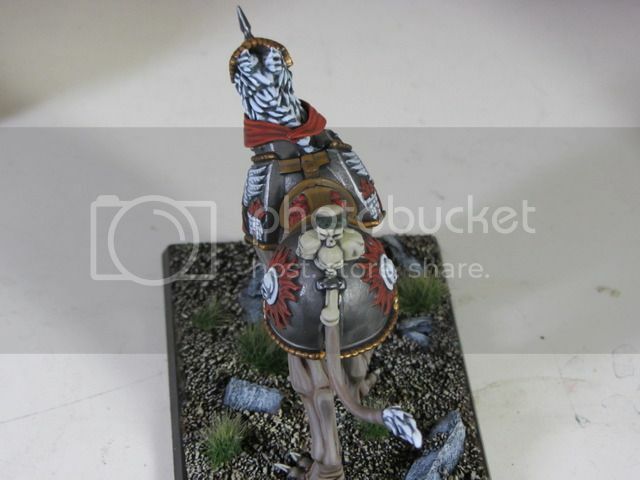 Greg: I kept going up to the counter and buying new washes/paints throughout painting this model! They're so good. I used the new bleached bone, new adeptus, fortress, base white, blood red, and some washes. One that particularly stands out is Nuln Oil, it is hands down better than badab black. It covers more smoothly instead of pooling, it's darker, and made the metal look overall far more metallic. Buy it! Buy it now! Kevin: The mane was my favorite part to paint, bald eagle lion, go! Seriously Peyton, I'm just blown away. Truly GAMBEBREAKING. Are you painting one unit or two of these? If you paint 2, would you do them the same or in different schemes? Wow I'm imperially turned on right now. Do you mind if I copy large portions of that color scheme? I was gonna paint mine with black lacquered armor and gold, but now I'm torn. Michael: You gotta get that new stuff man, these models are unbelievable! Noah: Rocking the same scheme for two units, that way if I decide to run three units of three I can easilly chop and change between units! 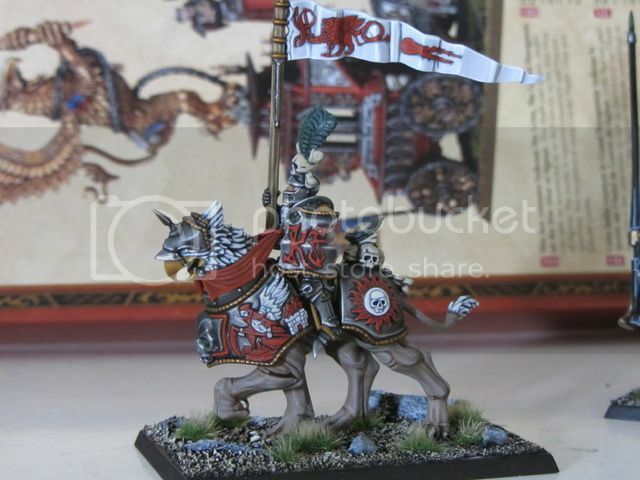 Gargobot: Go ahead man, I doubt I'm the only person with a red and white Empire army! :) If you're going to paint the armour details the way I did watch out, the reaper, flames and buildings on the breastplate took me an irresponsible amount of time! 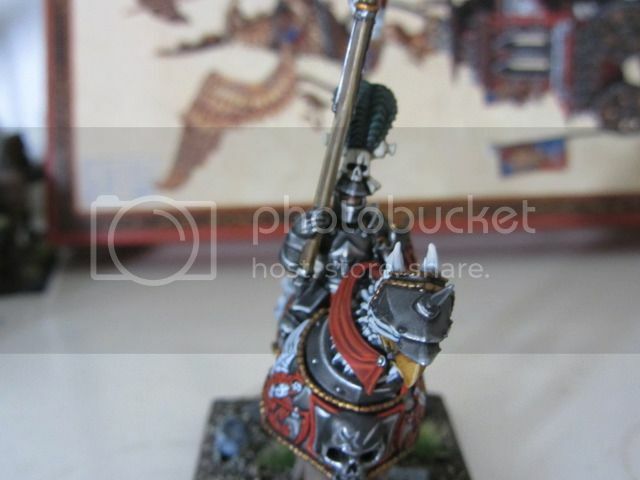 Finally finished the knight on top, this is the standard bearer of the unit. 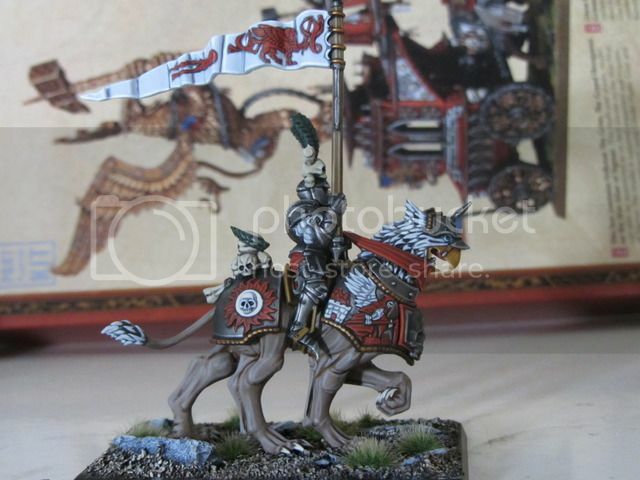 He didn't turn out as well as I'd hoped, maybe the Demigryph will distrace folks from the knight! The head's face does not have much definition (both the sculpt and my paint job) and is really small! In future I will probably only be using the fully helmetted heads or no helmet at all. 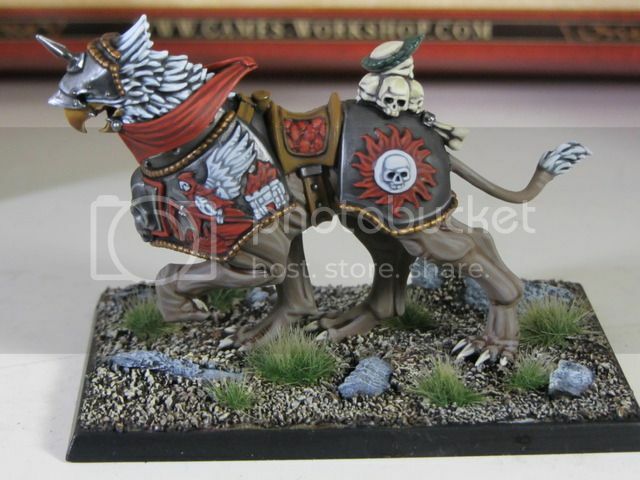 So, with my pre-orders having finally arrived, I have a question -- did you put the reins on before or after painting/priming? I put them on before priming, so that I could see where I'd have to position the knight's shield arm to be holding the reins. May not be the best way, but you can't see under the reins anyway, they are fairly tight to the bird's neck. How are you painting yours Caleb? All Yellow? I like it! Yeah -- I think the barding is going to be yellow. I'll have to decide on what else I want to do. I'm thinking about adding "cloth" barding to the back legs (to echo the peg knights), but I'm not entirely sold on it -- mostly because I doubt my green-stuffing abilities. I have scraped off the most egregious "empire-y" symbols on the barding, and will be adding in Bret shields/symbols. I'll also have to figure out the riders -- the straight up bret knights don't fit well because of the shape of their legs. The same is true for the older 5th/6th edition knights, but they're a little better. I'm going to see if there's a fix through carving them, or if I should assemble the riders that come in the kit, then "brettonify" them. Oh, I meant painting the whole demigryph yellow...like a battle budgy...nevermind. Cloth barding on the gryphs sounds difficult, plus I like my gryphs showing a little leg (insert winky face that in this font looks like it has down syndrome). If you do you'll be hiding a lot of detail. I'd say maybe use the demigryph knight bodies and legs and add bret heads and shields? yeah -- that might be what I end up going with. I'm supposed to get a few of the Kisleve winged lancers in a trade soon -- I may see if they fit. And yeah -- that's the thing I'm not sure of on the barding either. It will cover up a lot of detail. The good thing about greenstuff is that it's not very permanent.